There are rumors: if anyone offers recipe how to get rid of financial crisis now and in future, he gets Nobel Prize. Of course this post can not be qualified for Nobel Prize selection (unless you press “like” and recommend it to your friends 🙂 ). Probably because it contains just few hundreds words, comparing to long and boring economic manuscripts. Yet, I do not see reason why anti-crisis recipe should be longer. Actually financial crisis is something which devalues traditional assets (values 🙂 ) and diminishes cash in traditional cash flow sources. The above mentioned assets may be real estate, gold, oil, intellectual property. Recall recent real estate bubble, or Internet bubble in 2000, or just any bubble: You created innovative sleepers and sell them online, but crisis arrived and people do not have money to enjoy your innovative products. Many economists believe crisis is related to current models of supply and demand, thus any protection from crisis stimulation of customer demand (offering lower prices and new products) or investment demand (lower or higher interest and currency rates, investment incentives, etc.). Yet, all of these recipes use medicine, originated in our financial system, and in essence is the reason of disease: more money. There’s a good saying: “money is never enough”, and the keyword here is never enough. If real estate business suffers from sales decrease because people can not afford buying houses, you do not see solution other than offering cheaper loans. It means you wanna put your this business into chronic disease, called “more money“. People will always need more money, but money can not be more ! If there are (somehow, somewhere) “more money”, there should be more assets, which should guarantee these money. This is a simple principle, which you studied in childhood. But people grow up and forget many of taught at school… They create economic theories, business models… Probably you won’t believe, but 10 years ago for valuation of collateralized mortgage obligations I used Monte Carlo stimulation… Luckily I did not buy any of these papers. Simple things should retain so. If money is a measure of value, it should retain so and we should not create more money without adding value. If such happens – money lose value, so sooner or later this value is adjusted by crisis. Crisis is a cleansing procedure, which washes out problems and troubles of the past. Any cent in economy should be based on real product of service. Financial system is just a tool and should not earn money. Yes, some income to finance operational activities of bank is reasonable, but not more. 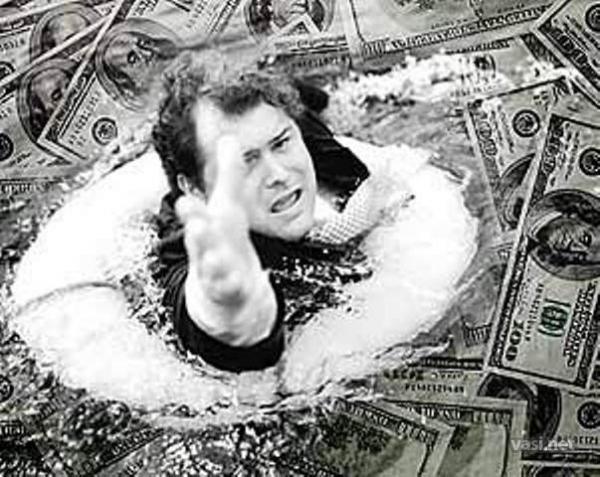 If banks make money, we’ll swim in boiling water from time to time. While banks will pray for even more money. From 2007 US government “subsidized” banking institutions with 27 billion USD. Just can not comment it. More money because more money was not as more as expected… Read Bible or Koran about charging interest. Interest is taboo; interest is wrong… do not charge interest… only if you charge it to… those you do not like.